Today I have for our the next fabulous video apart of my Vintage Vegan series sharing my green smoothie recipe. This is something I enjoy on a daily basis with either my breakfast or lunch. It’s delicious and nutritious and great for vegans (and people in general) as the vitamin C will help the absorption of iron in spinach. I’m very excited in the next few months to be further expanding my vintage vegan series. If you’d love to see more lifestyle and recipe videos do let me know in the comments below! 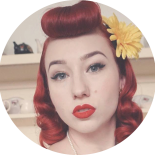 This entry was posted on January 24, 2019 by Miss Lady Lace in Pinup, pinup fit, vegan, Videos, YouTube and tagged 1940's, 1950's, blogger, glamour, miss lady lace, miss lady laces pinup blog, perth, perth pinup, perth pinup blog, perth pinup community, pin up, pinup, pinup blog, pinup blogger, pinup fashion, pinup girl, pinup life, pinup lifestyle, pinup perth, red lips, retro blog, retro girl, retro glamour, the perth pinup community, victory rolls, vintage, vintage blog, vintage blogger, vintage fashion, vintage girl, vintage glamour, vintage perth, vintage pinup blog.